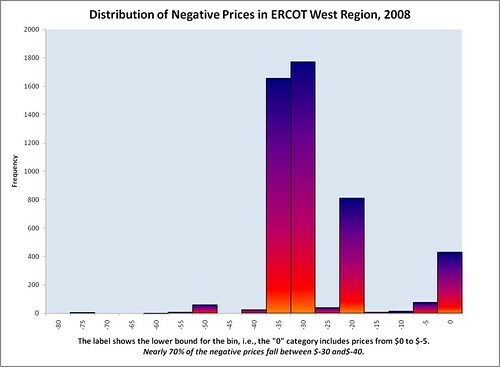 Last November I posted remarks on the frequently observed negative prices for power in ERCOT’s West region. In the post, which analyzed data from January through November, I linked the negative prices to the wind power capacity relative to the transmission capacity, and to the effects of the Production Tax Credit and other subsidies available to wind power producers in Texas. I recently extended the data set to include all of 2008 and have updated the charts in the original post. As expected at the time of the earlier post, November and December did see a return of frequent negative prices (which had almost entirely disappeared from mid-June through mid-October.) All told, about 14 percent of ERCOT’s 15-minute pricing intervals fell below zero. The charts are reproduced below along with a new chart showing the average price each day over the year. 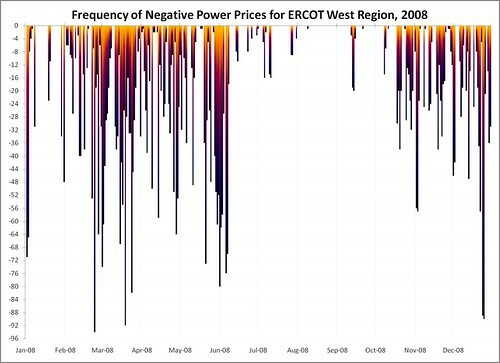 The unweighted average price for ERCOT West for the year was a positive $53.34. Unfortunately for wind power producers in the region, their output was higher during times that the price was low and their output was lower during times that the price was high. 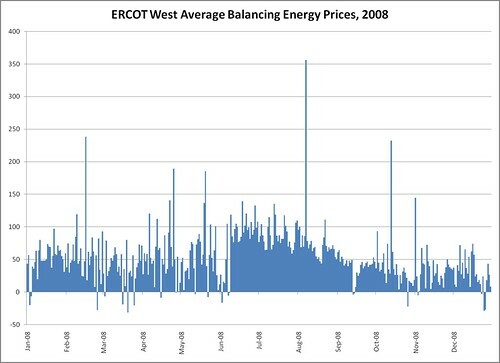 The charts were derived from data provided through the ERCOT website, on their “Balancing Energy Services Market Clearing Prices for Energy Annual Report” page.